(Vatican Radio) A Christian cannot understand Christ the Redeemer without the Cross, without being ready to bear the Cross with Jesus. That was Pope Francis’ message at Friday’s morning Mass at the Casa Santa Marta. 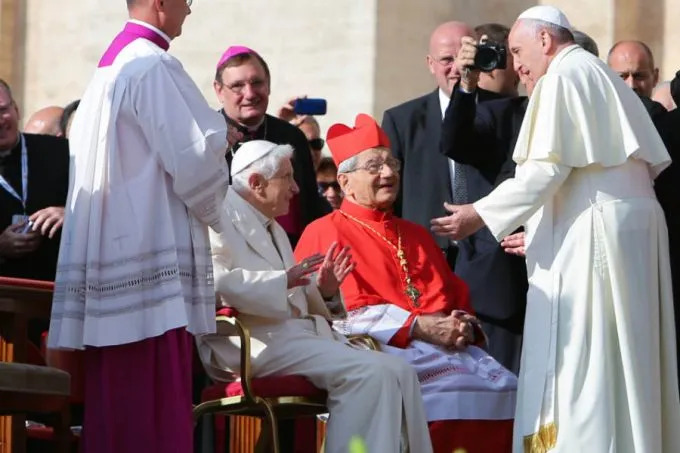 (Vatican Radio) The Holy See Press Office announced on Friday Pope-emeritus Benedict XVI will attend the encounter with Pope Francis and the elderly on Sunday morning in St. Peter’s Square. The encounter is preceding the Mass with Grandparents and the Elderly scheduled to begin at 10:30 am. Pope-emeritus Benedict XVI will not be at the Mass. Pope Francis has a fun side. (Vatican Radio) Pope Francis celebrated a special liturgy of thanksgiving in the Church of the Gesù in Rome on Saturday, to mark the 200th anniversary of the restoration of the Society of Jesus. Please find, below, Vatican Radio's English translation of the prepared text of the Holy Father's homily for the occasion. Thank-you for following up on the baseball article. I bet he played softball before he became the Pope. Seahorse I haven't read about his playing softball, but it would be good for him to practice catching a baseball before he comes to visit the United States in 2015. Also, I read that he loves soccer and tango. Vatican City: Pope Francis on Sunday hailed the value of the elderly, including his predecessor Benedict XVI, who joined him at a ceremony in St. Peter's Square honoring the contribution of grandparents to society. During the festive event in St. Peter's Square, Francis addressed some 40,000 elderly people - grandfathers, grandmothers, widows and widowers. The pope sought to underscore the importance of the old in society and he said homes for the elderly could not be allowed to become “prisons” where care took a back seat to business interests by those who run them. According to the World Health Organization, there are 600 million people over 60 in the world today and the figure is expected to double over the next 11 years and reach two billion by 2050, most in the developing world. It was only the third time since his resignation in February 2013 that Benedict, 87, attended a public event. He looked relatively healthy as he walked into the square using a cane and took a special seat in the front. Benedict, wearing a white overcoat, stayed for about an hour to hear old people speak about their lives and listen to a speech by his successor and then left before Francis led a Mass. Benedict, the first pope to resign in six centuries, has been living out his retirement in near isolation in a former convent in the Vatican gardens. He is assisted by aides and receives few visitors. “Violence against the elderly is as inhuman as that against children,” Francis said told the crowd, which was entertained by singers including world renowned tenor Andrea Bocelli. Vatican City, Sep 28, 2014 / 10:10 am (CNA/EWTN News).- Retired pontiff Benedict XVI joined some 50,000 pilgrims in Saint Peter's Square on Sunday, Sept. 28 for a meeting between Pope Francis and elderly people from around the world. Pope Francis, briefly, was a bouncer at a nightclub (supposedly) before he joined the seminary. I think it would explain why he likes the Tango, besides it is a fun dance. (Vatican Radio) The angels battle Satan for the destiny of mankind and win. They defend and custody the greatest mystery of the Church, God-made-Man. Even though in Satan often presents “humanistic explanations” for his attacks on mankind. This was the focus of Pope Francis homily at Mass Monday morning at Casa Santa Marta, marking the Feast of the Holy Archangels Michael, Gabriel and Raphael. Pope Francis concluded urging those present to pray to the archangels Michael, Gabriel and Raphael, and "recite the ancient but beautiful prayer to the archangel Michael, so he may continue to do battle and defend the greatest mystery of mankind: that the Word was made Man, died and rose again. This is our treasure. That he may battle on to safeguard it". Saint Michael the Archangel, defend us in battle, be our protection against the wickedness and snares of the devil. May God rebuke him we humbly pray; and do thou, O Prince of the Heavenly host, by the power of God, cast into hell Satan and all evil spirits who wander through the world seeking the ruin of souls. Amen. Vatican City, 29 September 2014 (VIS) – Today, in the Vatican Apostolic Palace, the Holy Father Francis received in audience the president of Malta, Marie-Louise Coleiro Preca, who subsequently met with Archbishop Dominique Mamberti, secretary for Relations with States. The cordial discussions focused on the good relations between the Holy See and Malta and highlighted the significant contribution made by the Catholic Church in the fields of education and welfare, especially in favour of the poor. The conversation then turned to various themes of mutual interest, with special reference to the role of Christian values in the edification of Maltese society and the strengthening of the institution of the family. Vatican City, 29 September 2014 (VIS) – “Yours is the fruit of a patient, careful, fraternal, competent and, above all, faithful work. If you do not believe, you do not understand; if you do not believe, you cannot stand firm”, said the Holy Father to the members of the United Bible Societies, whom he received this morning in the Consistory Hall for the presentation of the Italian language Bible, “Parola del Signore – La Bibbia Interconfessionale in lingua corrente” (“The Word of the Lord – The Interconfessional Bible in current language”). “I hope that this text, which is presented with the blessing of the Italian Episcopal Conference and the Federation of Evangelical Churches in Italy, will encourage all Italian-speaking Christians to meditate on, life, bear witness to and celebrate God's message”. Sr. Luzia Premoli, superior general of the Combonian Missionary Sisters, was appointed a member of the Congregation for the Evangelization of Peoples on Sept. 13, and spoke recently to CNA. (Vatican Radio) The conflicts in the Middle East and Ukraine demand a revitalized United Nations where member states put their responsibility to protect persecuted peoples above personal interests and thoroughly apply international law. This is according to the Vatican Secretary of State, Cardinal Pietro Parolin, who was speaking on Monday at the 69th session of the UN General Assembly. Cardinal Parolin, said the blood of the many Christians and ethnic minorities in Iraq and Syria, demands the international community assume its responsibility to protect populations under threat. He said the world is in need of a UN capable of deploying the appropriate action and force. VATICAN CITY - Pope Francis, who has expressed alarm over the rise of Islamic State militants and the plight of Christians in the Middle East, has summoned his envoys in the region to a rare meeting to discuss a response to the crisis, the Vatican said on Tuesday. The gathering will take place between Thursday and Saturday and include Vatican ambassadors to Jordan, Iraq, Iran, Lebanon, Syria, Turkey, Israel and the Palestinians as well as representatives to the United Nations and the European Union. They will hold talks with more than a dozen top Vatican officials, including Secretary of State Cardinal Pietro Parolin, who addressed the United Nations on the Middle East crisis on Monday. Earlier this month during a visit to predominantly Muslim Albania, Francis issued a strong criticism of Islamist militants, saying no religious group which used violence and oppression could claim to be "the armor of God".